When Caroline and her mother moved to Arizona, introverted Caroline found it difficult to make new friends. Rather than worry her mother over the issue, Caroline began lying to her and making up "friends" and activities to portray herself as popular and socially active. When the ruse is exposed at graduation, Mom seeks counseling for her and and reconsiders Caroline's plans to go away to college. 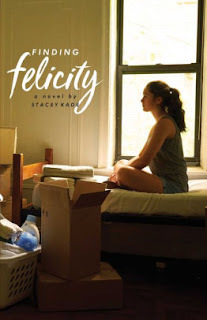 But going away to college and starting afresh is something Caroline feels is important for her plan to build a real social life with real people. Mom reluctantly lets her go but only under close supervision. College, however, does not quite turn out the way Caroline had hoped. Reaching out and making friends is just as difficult. And her carefully laid out plans keep falling through. Success in the end means letting go and allowing things to simply happen (and risk and confront failure). But to do that Caroline must overcome her fears of losing control. An interesting study of introversion. The title -- a reference to the TV series Felicity -- refers to Caroline's obsession with that show and the characters, but is surprisingly inconsequential to the story, except to illustrate how unlike the TV world the real world is. What the story actually focuses on is the way that so people try to reinvent themselves in their first year away from home. Kade does a nice job with that, although some of the logistics of orientation that she describes seem outdated (like rushing to the college bookstore to buy books). The book is a breezy read, but that comes at the cost of some character development. Caroline and her roommate have some depth to them but the other characters (so important in a story about friendship) were underutilized.